What you can do when you wear AR glasses now? See news headlines, social updates, arrows showing direction, you steps, heart rate status, new email. Not much, everything is tied to the internet, and couple of sensors. But there is a vast amount of things that lie outside of internet: tables, coffee makers, books, lights, clothes, whole environment. All these things can give information, and ability to control either using UI, or seamlessly from sensors on our body (Intensity of light at night can be controlled by measuring diameter of eye pupil). Physical things, and data, and UI. This creates a huge business opportunity. And here comes great lie about IoT: it is not possible to put these on the internet, and doing so makes no sense, because possibilities of human interaction is severely limited. That is why thinking about physical things in terms of internet is seriously flawed. So, what options are available? Bluetooth needs pairing, or it could send only id, for WiFi, to work all devices has to be in the same network + all that network stack. NFC works, well, when things are close. ZigBee is used more in industry, there are no radios in current mobile devices for that - all these were developed as a solutions for different problems, but none of them is feasible for AR. 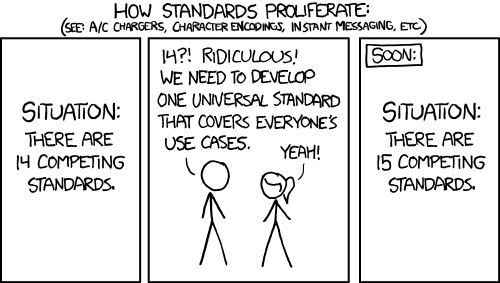 Apple tried to use existing standards in products like: iBeacons, HomeKit with little success. So in what Apple is the best? Hardware.